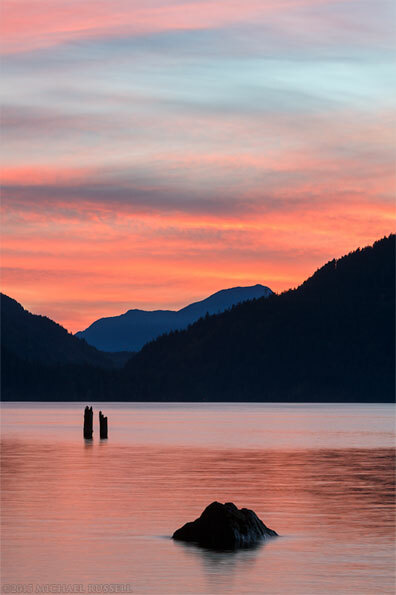 A vivid Harrison Lake sunset near Harrison Hot Springs, British Columbia, Canada. The distant mountains are Sasin Peak and Deroche Mountain. A few days before I made these photos of a sunset at Harrison Lake I talked online about not making very many sunset photographs and generally avoiding them. Most often at sunset I am photographing what that light is reflecting off of, not the sky itself. I find the majority of sunset photos out there to be rather banal unless they have an actual subject of interest other than the sunset itself. That said, I had to pull over to the side of Rockwell Drive on the shore of Harrison Lake when I saw this light starting to develop (somewhere between Sasquatch Park’s Green Point and Harrison Hot Springs). The challenge then was to find something to do with it, and there was no time to get in position somewhere I knew to be favourable. 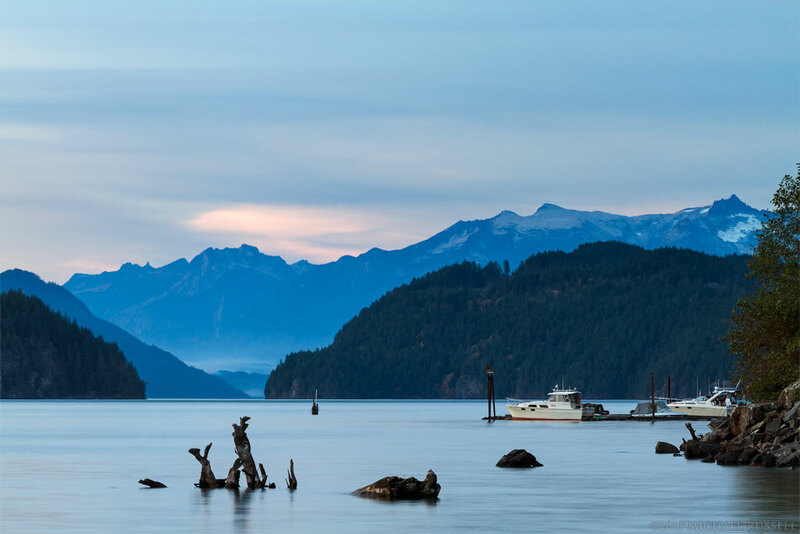 The first photo here shows Sasin Peak, Deroche Mountain, and some fortuitous rocks and old dock pilings in Harrison Lake. 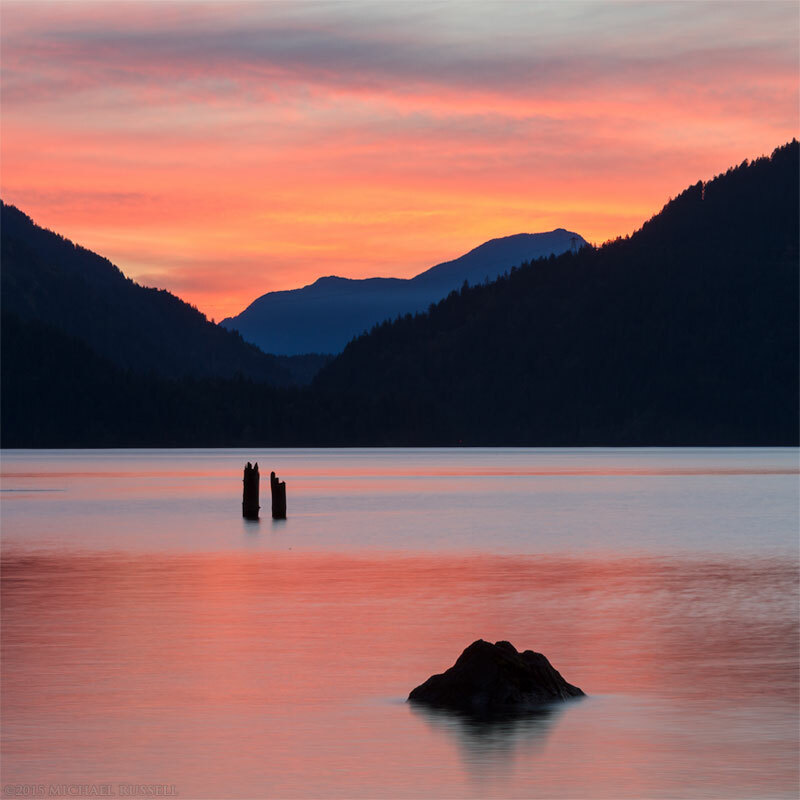 I also made a square version of this Harrison Sunset. Before the colours to the west really exploded, I made this exposure looking north towards Mount Breakenridge. The colour here is much more subtle, but it works regardless. When the sky to the west became really vibrant this last scene here had very little color, even less than when I made this photo. Strange how that sometimes works out. 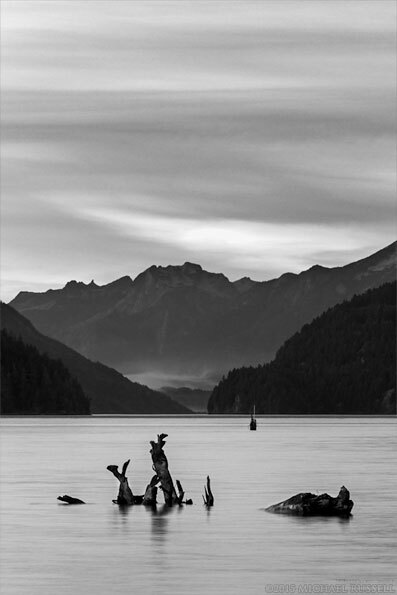 As you know I occasionally work with black and white for some of my photos, and so here is one last photo of the same scene with a different composition. For more photographs of Harrison and other lakes visit my Lakes & Rivers Gallery. Really nice colours but I really like actually the black and white, it must be a nice place to visit! Thank you Dalida! I actually might prefer the black and white as well, even of the bright sunset color photos. Harrison Lake is a nice place to visit, I am lucky that it and many other places are within an hours drive.